A Hingham car accident sent three motorists to the hospital and officers think they know who’s responsible for the accident. They believe a Plymouth man with a long record of traffic violations has done it again, according to the Boston Globe. Officials have located the man’s driving record and have concluded that he’s previously received nearly 20 speeding tickets, has been involved in five car accidents and is facing his 11th driver’s license suspension. The man has received at least one traffic citation almost every year since 1987. He’s been cited for a payment default, driving to endanger, violation of open drink policy, lacking an inspection sticker, speeding and much more. Sergeant Steven Dearth with the Hingham Police says that this man has the longest driving record that he’s ever seen. Our Massachusetts car accident attorneys understand that drivers who receive numerous citations within a five-year period are considered by the Massachusetts Registry of Motor Vehicles to be a habitual offender. One of the punishments for being a habitual offender is that that your license is suspended. The man accused of the recent Hingham car accident had already been deemed as a habitual offender, but still had his license when the accident occurred. When the accident happened, the Massachusetts Registry of Motor Vehicles immediately suspended the man’s license because of the discovery of his extensive record. The most recent accident happened on Main Street in Hingham when the man drove over the double yellow center lines and into the path of oncoming vehicles in the northbound lanes. It happened at roughly 9:00 p.m. Once he was in the lanes of oncoming traffic, he hit another vehicle head on. Both occupants of the oncoming vehicle were hospitalized. 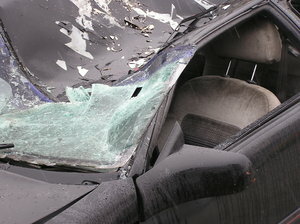 Police report that they were both buckled in at the time of the collision. The driver with the lengthy record was not buckled him when the accident happened. He was transported to the Boston Medical Center and was treated for serious injuries. Officers say that he was under the influence of alcohol at the time of the accident. Reports indicate that he also had open bottles of alcohol in the vehicle. He is currently facing charges for two counts of operating under the influence causing serious injury and negligent operation, a first offense of operating under the influence, marked lane violations, driving with an open container, driving to endanger and a seat belt violation. The man’s license has only been suspended though, not revoked. A permanent revocation only occurs after a driver has been convicted of 5 OUIs or they’re pulled over after three OUIs and refuse to take a Breathalyzer test. Drivers are urged to be cautious on our roadways as we head into the holiday season. Roadways are expected to get more crowded with holiday traffic. Drivers must navigate our roadways defensively to avoid a serious accident with an irresponsible driver. If you or a loved one has been injured in a car accident in Massachusetts, contact Boston Injury Attorney Jeffrey S. Glassman. Our firm offers free and confidential appointments to discuss your rights. Call 877-617-5333.